(CNN) – GOP Sen. Thad Cochran of Mississippi had already commented about Eric Cantor's stunning primary loss earlier this week. So why did he appear unaware of the outcome when asked about it on Thursday? "I don't know what you're talking about," the six-term senator said in an interview with Fox News, when asked about the race. "What happened in Virginia?" A spokesman for Cochran said the senator "had been asked that question repeatedly and answered it repeatedly." "He felt it was time to move on from the subject," Jordan Russell said, implying the senator was being sarcastic. Cochran, who has own tea party insurgency to face in a runoff against state Sen. Chris McDaniel, insisted in the Fox News interview that he didn't know about the results. "Well I haven't really followed that campaign very closely at all," he added. Cantor announced Wednesday he would step down from position as House majority leader at the end of July, and House Republicans will vote next week on his replacement. What did Cochran have to say about Cantor's loss to a little known and underfunded challenger? "Yeah well it happens. You know members of Congress, some win some lose. It's not an automatic proposition that you get re-elected just because you've done a good job," Cochran said. But Cochran had made previous statements about Cantor's loss the day before the Fox News interview, proving that Cochran was indeed aware of the primary upset. "I, like a lot of people, were surprised by the margin of victory for his opponent, but that happens in politics," Cochran said, according to Mississippi News Now. "So, what else is new in politics, and some people win, some people lose," Cochran told local reporters on Wednesday, reacting to Cantor's defeat. Cochran's apparent sarcasm comes as he's been accused of being out of touch with the tea party. Back in February, Cochran told reporters he "didn't know much" about the conservative movement. 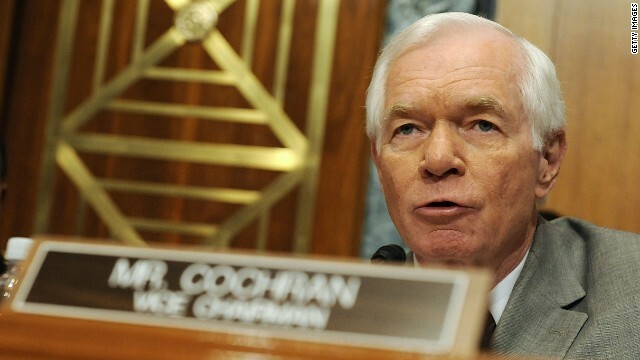 "The tea party is something I don't really know a lot about," Cochran said in February. Cochran and McDaniel are headed for a runoff election on June 24, after neither candidate clinched 50% of votes in the June 3 primary. He was being sarcastic? That's the standard excuse whenever a conservative makes a gaffe, "Oh, I was just joking." Well, duh, they can't blame Obama for that loss so he can't come up with anything to say. Probably waiting on the oxycodone fat radio boy and the kochs to tell him and others what to say. Perhaps he misplaced his alternate reality ring? Having to listen to Tea Party drivel is enough to make anyone lose their mind for a short while. I'm just surprised it took him this long. "Cochran's apparent sarcasm comes as he's been accused of being out of touch with the tea party." Can't say I blame him. I myself generally end up with a migraine if I spend too much time listening to their drivel. But that didn't stop weepy the drunk from trying! Evidently neither is the news....anything you really know a lot about Senator. Shout out to Lynda, Wake up, Sniffit, Rudy NYC and the rest of "the gang"!! It doesn't matter which GOP clown wins , he'll get swept OUT in November in a democratic WAVE. After all, who's going to vote for the GOP that has done NOTHING for the past SIX YEARS, EXCEPT BLOW 24 BILLION DOLLARS in 16 DAYS!!!!!!! Evidently neither is the news….anything you really know a lot about Senator. Shout out to Lynda, Wake up, Sniffit, Rudy NYC and the rest of “the gang”!! I see the soap opera continues unabated complete with Red Met Fridays in the form of the President's decision on Iraq. Working hard my sister, trying to get to the working smart part of the program. See you when I can see ya'! For all the difference Cantor ultimately makes, who really cares? !